The remote location of Tambopata Ecolodge, 68 kilometers by land and river from the nearest town, deep in the forest and close to natural oxbow lake ecosystems, means that the most remarkable attractions of the South American rainforest can be reached easily in half-day or full-day excursions, while evenings can be spent relaxing and enjoying our hotel standard accommodation, restaurant and bar services. At Tambopata Ecolodge a visit to unspoiled tropical forest habitats does not mean enduring discomfort. We offer our guests excellent lodge accommodation, with hotel-style comfort, infrastructure, facilities and food. Our six SUITE rooms are spacious (34 m2 / 366 sq. feet) and fully screened against insects. Twin rooms are equipped with two double beds, double rooms with a king size bed. All beds are fitted with mosquito nets. Rooms have nightstands with lamp, a table and chairs, as well as a separate alcove with chest of drawers and closet space, and private adjoining bathrooms, with hot water provided by solar energy, and are supplied with bathrobes, slippers, cold drinks and a safe storage drawer. Each SUITE room’s private porch (11.5 m2 / 124 sq. feet) is furnished with chairs, a table and hammocks. SUITE rooms have electrical lighting. This lighting is available between 5:00 pm and 10:00 pm. In the bar area, the Ecolodge provides recharging facilities for mobile phones, pads, and assorted batteries, at midday and in the evening between 5:00 pm and 10:00 pm. Our comfortable SUPERIOR rooms measure 24 m2 (258 sq. feet) and are fully screened against insects. Twin rooms are equipped with two twin beds, double rooms with a queen size bed with a night stand and chairs. There is a built-in closet area with drawers. All beds are fitted with mosquito nets. Rooms have private adjoining bathrooms, with hot water provided by solar energy. SUPERIOR room porches (10 m2 / 108 sq. feet) are furnished with chairs, a table and hammocks. There is no electricity supply in the SUPERIOR rooms, and at night lighting is provided by candles. In the bar area, the Ecolodge provides recharging facilities for mobile phones, pads, and assorted batteries at midday and in the evening between 5:00 pm and 10:00 pm. The exteriors of our cabin-like rooms are designed from local materials to harmonize with their surroundings. The Ecolodge’s interiors have been created with your comfort in mind, while many of the materials employed have been imported to the zone to minimize local environmental impact, while enhancing the luxurious feel of the accommodation. Rooms are spacious, well-decorated, comfortable and fully-screened against insects. Our two categories of accommodation –SUPERIOR and SUITE- have private bathrooms with light and hot water provided by solar panels, and each cabin has its own porch with hammocks for relaxing between trips into the surrounding forest. Peru is justly famous throughout the world for its fine cuisine, and at Tambopata Ecolodge we do everything possible to honor that tradition. After spending the day in the company of our guides, or even walking part of the sign-posted 25 kilometer trail system around the lodge independently, there could be no better way to spend the evening than a fine meal in our excellent restaurant or an exotic cocktail in our well-stocked bar. 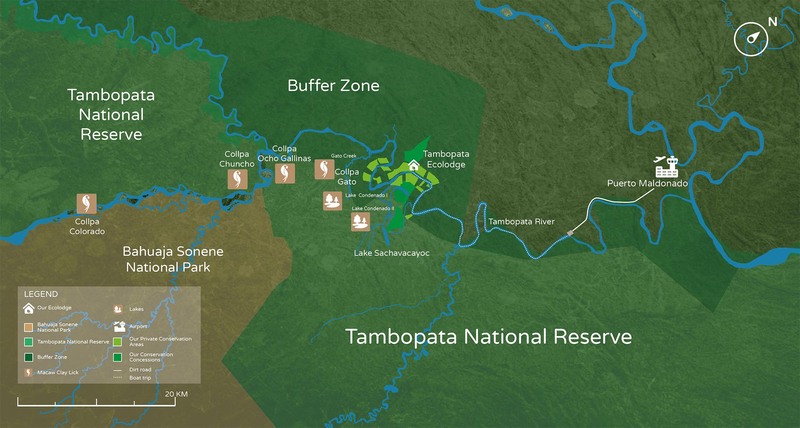 Tambopata Ecolodge selects safe and appropriate riverside locations for its campsites. The equipment provided for Ecolodge guests during itineraries that include camping excursions includes tents for sleeping, mattresses, sleeping bags, sheets, pillows, towels and biodegradable soap. In addition, a dining tent is provided, equipped with folding tables and chairs. Candles and lamps are used at night to light the campsite. All meals are cooked and served by Ecolodge staff during camping trips. A balanced diet is offered, and vegetarians and vegans can be catered for. The campsites selected are located some distance from the macaw clay lick, to avoid disturbing birds and other wildlife at the lick. All waste is returned to the Ecolodge for proper disposal.